Before ornithologists and other biologists began emphasizing the evolutionary relationships of animals when classifying them, scientists based their classifications on similarity. Because of this, many small, earth-toned bird species were named sparrows. Though sparrows represent several different evolutionary lineages, most share similar plumage, size and diet. Sparrows are easy to observe -- several species are frequent visitors to bird feeders. Today, scientists know that most of the birds called sparrows form two distinct lineages, though many different evolutionary lineages contain birds colloquially called “sparrows.” One the two primary lineages, the family Emberizidae, evolved in the New World, and contains about 300 species, including the closely related buntings. Forty-nine species of Old World sparrow form the family Passeridae. Most sparrows are relatively drab, brown or grey and white birds; however, many have prominent marks that help differentiate the various species. The males and females of most species look similar, though Old World sparrows may exhibit slight sexual dimorphism, with males being slightly larger and having bolder colors than females. 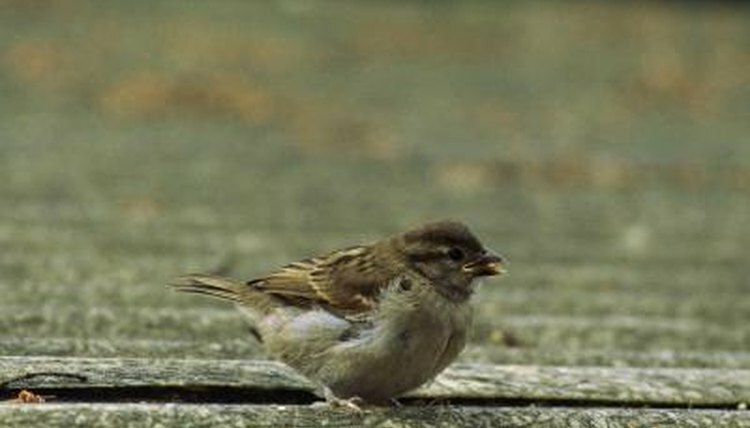 Most sparrows have some type of striping or pattern on their ventral sides. Most sparrows are relatively small birds, averaging about 5 inches in length, though some species are slightly larger than this. Sparrow wingspans vary from about 6 inches in small species, to 12 inches in larger species. Small sparrow species weigh a little less than an ounce, while large species and individuals may attain double that. Sparrows typically inhabit open areas, such as fields, meadows and forest edges, and this influences the food available to them. Sparrows are primarily seedeaters, and both evolutionary lineages have strong, conical beaks. However, during the summer breeding season, many sparrows increase their protein intake, feasting on the abundant insects. Sparrows also consume small fruit, such as cherries, dogwood berries and black berries from time to time. Both New World and Old World sparrows are frequent visitors to backyard bird feeders. The ubiquitous house sparrow (Passer domesticus) is a common sight; millet, milo and sunflower seeds are some of their favorite types of seed. Black oil sunflower seeds are better suited to house sparrows and their like-sized relatives, as striped sunflower seeds are too hard for the little birds to crack open easily. Additionally, house sparrows love to partake in birdbaths, and you may see them using their wings to splash the water all over their bodies.